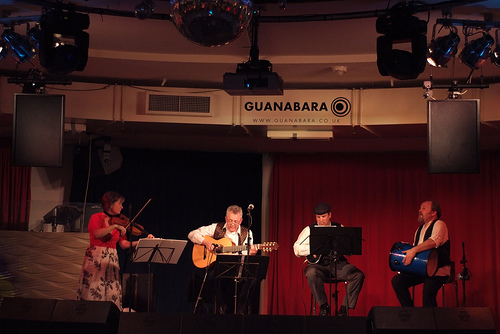 Choro Bandido, Surrey based quartet playing Brazilian popular instrumental music. One of few groups in UK to have studied the genre and offer a choro repertoire. The four members of Choro Bandido formed the group after many years of playing Brasilian samba together. Their love for Brasilian music has led them to studying a genre from early 20th century Rio de Janeiro, “Choro”. Choro emerged in Brazil at the turn of the 20th century and blends the music of the 19th century Portugese courts, early samba rhythms and elements of ragtime. Choro Bandido are one of just a handful of groups playing this musical genre in the UK. They have used their wide base of musical knowledge and skill to take Choro to many types of event and celebration.